The Dodge Viper T/A 2.0 coming off of the track. The Dodge brand rocked the automotive world in 2014 with the introduction of the Hellcat Challenger and Charger with the 707 horsepower supercharged Hemi making these some of the most powerful production cars in the world. The performance of the Hellcat Challenger and Hellcat Charger combined with the slow sales of the Viper caused many people to believe that the Mopar supercar was once again nearing its end, but new reports indicate that Dodge doesn’t plan to kill the Viper. Instead, it sounds like they intend to improve the Viper during the 2015 calendar year. 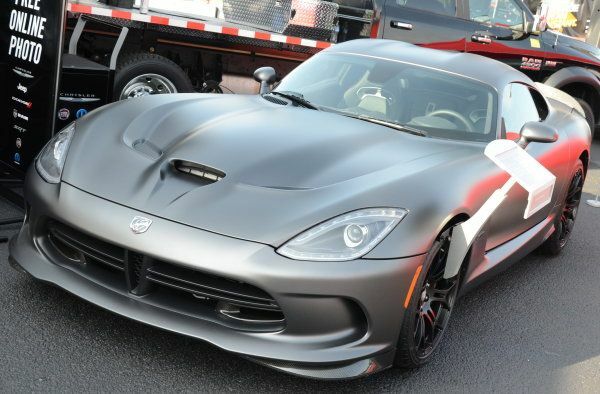 Back in 2013, the 2012 Chrysler Group financial statement indicated that the Viper would be refreshed during 2015 and these new reports indicating that Dodge will turn their attention to the Viper next year works to support those plans back in 2013. Unfortunately, none of these reports offer any indication as to what the Chrysler Group engineers might have in store for the 2016 Viper, but we can make some guesses based on the history of the model and the look of the current supercar segment. We don’t have any official word on what we might see new for the Viper during the 2015 calendar year, but there are a few obvious holes in the current Viper lineup that I expect to see filled for the 2016 model year. First and foremost, Dodge needs to get a Viper roadster back in dealerships. Throughout the Viper’s existence, a convertible or roadster model has introduced an exterior design followed by a coupe sporting that same look. The Chrysler Group changed things up for the 5th generation, introducing the 2013 SRT Viper as a coupe only and I believe that this is one of the things slowing Viper sales. The Viper has generally been offered as a coupe, but it is best known for being a roadster. Dodge needs to bring that open air supercar back and I believe that we will see that happen during the 2015 calendar year. Second, whether or not we see a 2016 Dodge Viper Roadster introduced in 2015, I still expect to see a premium performance model sporting the American Club Racer (ACR) badge. While Dodge has rolled out more trimlines than ever for the current Viper with the base model SRT, the GT, the GTS and the Time Attack, a buyer who wants the performance of the previous generation Dodge Viper SRT10 ACR is left hoping for something even faster than the TA. That something should be new Viper ACR and that new model should work to set a new benchmark for the American supercar segment. In addition to the long awaited arrival of the gen 5 Viper roadster, I expect to see some performance increases from the 2016 model and the standard by which the newer Viper will be compared is the 2015 Chevrolet Corvette Z06. One of the “problems” with the current Dodge Viper is that the current Chevrolet Corvette Stingray is far less expensive while being very competitive with the Mopar supercar. Dodge needs to widen the performance gap between the Viper and the Stingray, so tweaking the current Viper in a way that assures that it can beat the new Corvette Z06 is the best bet to end the “which is better” conversations. If Dodge wants the Viper to hold the same weight in the performance world as it did back in 2008-2010, it needs to be one of the best supercars in the world and that begins by beating the Corvette Z06 in every imaginable race. However, talking about it is one thing – doing it is another. With the new Z06 in dealerships now, Chrysler can now begin to engineer a new Viper that will beat the Corvette on any track in the world.